As a popular destination for both tourists and Sarasota locals, Siesta Key has plenty of things to do and happy hours to choose from with generous drink and food specials. You can save a lot of money on drinking and dining out by capitalizing on happy hour specials and sample some of the best food that the island has to offer. Colorful, fruity frozen daiquiri’s are the most popular beverage of choice at the famous Daiquiri Deck. This location is within walking distance of the Tropical Breeze Resort. 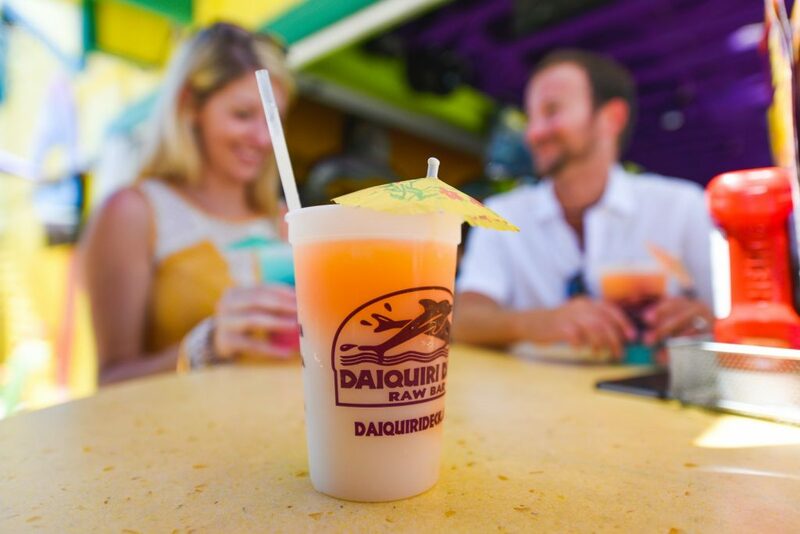 The Daiquiri Deck has one of the island’s most legendary happy hours which runs from 3 to 7 p.m. every day of the week. Happy hour specials include 2 for 1 frozen daiquiris, 2 for 1 well drinks, and discounts on house wine and domestic beer pitchers and pints. Conveniently located in Siesta Village, it’s always worth it to stop at the Daiquiri Deck whenever you’ve been out at the beach and want a few drinks to wind down while listening to live music. Siesta Key Oyster Bar and Restaurant (SKOB) features a happy hour that runs from 3 to 6 p.m. every day with huge discounts on popular seafood items like Louisiana crawfish or oysters as well as various drink specials. One of the island’s top hangout spots, it’s another excellent choice for high quality seafood and drinks with live music every night. Choose from over 20 beers on tap at SKOB as well as several unique and delicious cocktails. Stay a little longer past the happy hour if you want to see how fun and lively this restaurant can be. The Hub Baja Grill in Siesta Village offers its own branded take on the happy hour called the “Fiesta Hour” which runs from 11 a.m. to 6 p.m. and then again from 10 p.m. to midnight, Monday through Friday. You’ll get major discounts on margaritas on the rocks, wine, well drinks and domestic drafts if you stop by during this time. Check this happy hour out for their great food as they definitely take pride in their cooking and offer a nice selection of Pan-Latin fare. The Beach Club is an oft-frequented nightclub in the village that hosts a daily happy hour from noon to 7:00 p.m. with discounts on margaritas, wine, bloody marys, well drinks and domestic drafts. They also have a “Craft Draft Powerhour” from 5 to 8 p.m. every day with discounts on craft beers. Check out their happy hour if you’re looking for a venue with more of a focus on live music, partying and dancing. To get more information about Siesta Key happy hours or book quality accommodations right by all the fun and excitement of Siesta Village, contact Tropical Breeze Resort today at (941)-349-1125.